On this date in 1537, a Scottish noblewoman suffered the fate decreed for her treason — in the terse entry of the judicial record, combusta. Knocking around Glamis Castle — where Shakespeare’s great villain Macbeth got his start, as Thane of Glamis* — Janet Douglas had the going enmity of Scottish king James V on the substantial grounds that Janet’s father had held the teen-king his virtual prisoner for a few years in the 1520s. Once James got free, he proscribed the lady’s brother, the Earl of Angus (whom Janet continued to shelter when occasioned), confiscated properties, forbade Douglases from approaching his person, and all that sort of thing. Six years later she was more successfully returned to the dock, this time on a charge of plotting to poison the king himself. There seems to remain very little detail that would trace the precise unfolding of those years and offer later interlocutors a clear interpretation; while “innocent noble railroaded” is the most conventional read — Henry VIII’s agent reported that the conviction was secured “without any substanciall ground or proyf of mattir” — this book gives it a “maybe she did, maybe she didn’t” spin. That whole embittered proscription thing cuts both ways, as motives go. King Jamie took over Glamis Castle and hung his spurs there until his own death in 1542 … whereupon his crown passed to Mary, Queen of Scots, and the castle reverted to that young John, the new Lord Glamis. * Not actually true of the historical man Macbeth. ** Not to be confused with the New York Times. Actually, there are several ghosts who go by this colorless title. 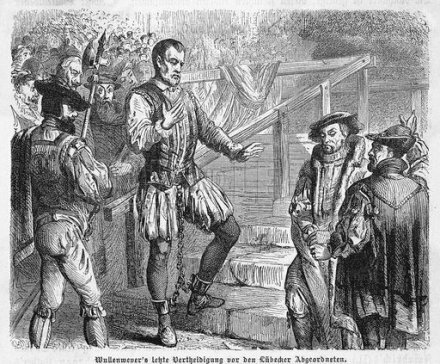 On this date in 1537, an Irish lord and his five uncles were hanged and beheaded at Tyburn for revolting against Henry VIII: the last act in an entire cycle of executions. Thomas FitzGerald‘s father, the king’s Lord-Deputy of Ireland, had been summoned to London to answer the complaints of his rivals and there committed to the Tower. Said rivals then cunningly circulated reports that dad had been beheaded, inducing the hot-headed (and finely-appareled) heir Thomas to renounce his allegiance and rebel with a dramatic retinue of 140 silk-bedizened gentlemen. 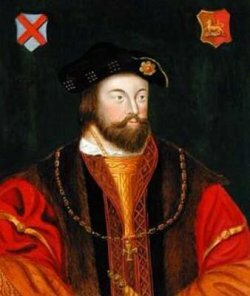 The Earl of Kildare hadn’t really been executed at all: he just died of shock and grief upon reading the reports of what his son had got up to in his absence. Stuff like, besieging Dublin Castle where he hunted down the fleeing Archbishop (a longtime enemy of the Kildares) and had him instantly put to death. Instead, Silken Tom holed up in Maynooth Castle where he soon found himself on the receiving end of a siege. 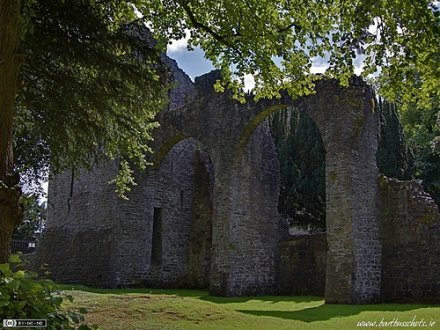 Maynooth Castle in its present, romantically ruined state. (cc) image from Bart Busschots. Thomas and his silk went off to find some allies to relieve it, hoping to play a Catholic-resentment card against Henry VIII’s rift with Rome. But the local response was desultory and while the new Earl of Kildare was busy beating the bushes, the English took the castle — issuing to its garrison the “Maynooth Pardon”, the ironical sobriquet for executing most of the lot. His rebellion having been all downhill since the big silken resignation, Thomas was eventually induced by promises of safekeeping to surrender himself to the royal mercy. But said mercy was not forthcoming, and he endured a year-plus locked up in something less than his trademark finery — “I have had neither hosen, doublet, nor shoes, nor shirt but one; nor any other garment but a single frieze gown … so I have gone wolward, and barefoot and barelegged,” he complained in a letter — until, attainted by the Irish Parliament, he was executed with his kinsmen. 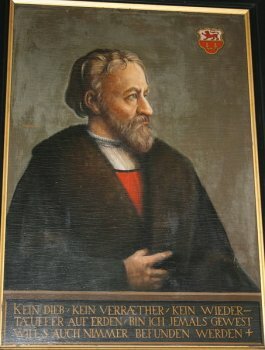 Although the Kildare title disappeared for a time, Thomas FitzGerald’s young but hunted half-brother escaped to the continent, bounced all over Europe for a decade, picked up an education, fought the Turks, and returned to receive his family’s peerage re-granted so he could practice alchemy in his castle as “the Wizard Earl”. When next in Kildare Town, stand a drink or two for these hearty bygone Geraldines at the Silken Thomas pub.